The Skylark Dimmer is the original designer style slide dimmer from Lutron. Features a convenient rocker switch that turns light on/off. Easy to use slide control adjusts the light to suit any activity. Slide up to brighten, down to dim. This is for use in single pole, 450 Watt Magnetic Low-Voltage applications. This dimmer easily replaces any decorator style switch and works with existing multi-gang decorator wall plates. Coordinating Claro wall plate and accessories sold separately. Decora Digital/Decora Smart Matching Dimmer Remote is designed to be used for multi-location control of Leviton's line of Decora Digital and Decora Smart Dimmers allowing the lighting to be controlled from the main dimmer or the remote location. 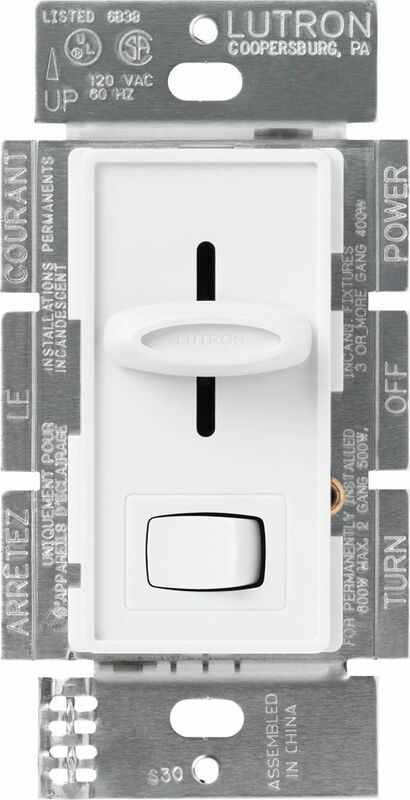 It works using digital circuitry that provides soft fade on/fade off, intuitive operation and a stylish form factor that is compatible with Leviton's Decora wall plates (sold separately). White face assembled on device with ivory and light almond face plates included. Change the colour of the dimmer at any time by ordering a new face plate colour change kit (DDKIT). Face plate colours include white, ivory, light almond, grey, black, brown and red. Skylark 450-Watt Single-Pole Magnetic Low-Voltage Dimmer, White The Skylark Dimmer is the original designer style slide dimmer from Lutron. Features a convenient rocker switch that turns light on/off. Easy to use slide control adjusts the light to suit any activity. Slide up to brighten, down to dim. This is for use in single pole, 450 Watt Magnetic Low-Voltage applications. This dimmer easily replaces any decorator style switch and works with existing multi-gang decorator wall plates. Coordinating Claro wall plate and accessories sold separately.